The Main Deck (Japanese: メインのデッキ Mein no Dekki), usually simply referred to as the Deck (デッキ Dekki), is a pile of cards that a Duelist can draw from during play. 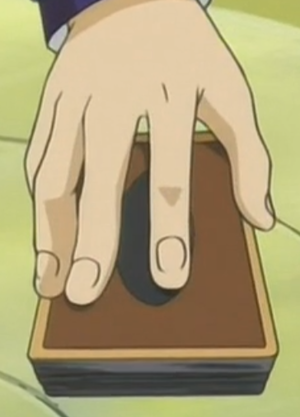 Each Duelist uses his or her own Main Deck in a Duel. When constructing a Deck, Monster, Spell and Trap Cards are placed in the Main Deck. Fusion, Synchro, Xyz and Link Monsters are placed in the Extra Deck. If a player uses official Token Monster cards, these are to be stored in a separate location as well. When a Duel begins, the Main Deck is placed face-down in the Deck Zone of the field. All cards in the Main Deck must remain face-down during the Duel (unless a card effect like "Convulsion of Nature" says otherwise). During a Duel, neither player may view the contents of either player's Deck unless a card effect allows them to, after which the Deck must be shuffled. Even if a card in the Deck is face-up, it cannot be looked at by either player unless it is on top of the Deck, in which case it is public knowledge. The Main Deck must contain only Legal cards. A Duelist may not have more than three copies of any Unlimited card included in their Main Deck, Side Deck, and Extra Deck combined. If a Forbidden, Limited, or Semi-Limited List is used, the number of copies must not exceed those requirements. Cards which have their name permanently treated as that of another card are considered to be the same as that card for deck construction. The Main Deck must be constructed using only card product provided at the event. The Main Deck can have a minimum of 20 cards. There is no maximum size. A Duelist may include as many copies of any card he or she likes, even more than three. This page was last edited on 10 June 2017, at 04:26.